For our latest Live Streaming Video production (QBS Live Mondays), I wanted to see how (or if) the additional of this video offering would effect the performance of the customer’s email marketing efforts. Specifically, I wanted to know if adding video would lift their email open and click-thru rates. I compared the performance of QBS Research’s May 2009 Newsletter (emailed to their list on 5/5/09) with the announcement of the QBS Live Mondays show (emailed on 5/28/09). I should note that there were other links within the email other than to the video content. Interestingly, the links to the video content accounted for 64.7% of all the click-thru within the email. In other words, close to two-thirds of all clicks went to the video links. As I continue to measure the effectiveness of our podcasts and Live Streaming Video productions, I’ll be sure to pass that information along to everybody reading this blog. If you have any questions, please leave them as a comment below. What effect does adding video have on an audio podcast? Because of my workload, I’ve not produced as many LiLV episodes as I (or our viewers/listeners) would like. As a result, I was seeing an understandable decrease in the number of downloads per episode. I was not too happy about the decrease. . .but again. . .I understood. In appreciation to those listeners who stuck with the show, I wanted to offer up something new. . .an “inside baseball” look into what producing the LiLV Podcast looks like. So, the last couple of episodes have been produced as a live streaming video production, with live chat. The feedback from the hundreds of people around the world who attended the live shows was gratifying. But what I was really curious about was whether or not adding the ability to download video on demand would positively impact the number of times a particular episode would be downloaded. The answer, I’ve recently learned, is that adding video does increase the number of downloads per episodes. . .significantly. Now, because the subject matter of every episode is different, some are downloaded more than others. 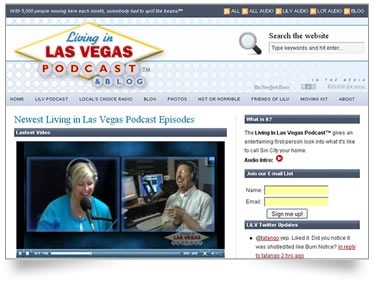 But when I compared that last two episodes we produced that did not have a downloadable video option (64: Dining at Wynn Encore, New Year’s Eve with 20-Somethings and 65: Living the Loft Lifestyle in Las Vegas) with the last two episodes that did have a video download option (66: Learning About the Origins of Las Vegas at Springs Preserve and 67: Southern Nevada Art Gallery in Downtown, Re-piping the House, Miss USA, Britney Spears), I measured a 50.3% increase in episodes downloaded. I have to admit I was a bit surprised by these results. I felt that video would certainly bump up the numbers but did not expect video to account for two-thirds of each episode’s downloads. It is clear to me that in this Internet world of ours, even though we are all so easily connected, people want to feel a real connection with others during their online travels. And adding video to your podcast (or adding video in general), when the video is well-produced (content+technically) goes a long way towards improving the approachability of your website and further humanizes what can be a less-than-human(y) environment. This means that if you’re even remotely toying with the idea of adding video to your podcast as a means of driving more downloads and bringing yourself closer to your website visitors, I’d advise you to do so. The increase in numbers is gratifying and besides, now your mom can finally see what you’ve been doing all this time! By the way, for those who’ve recently added video to their marketing efforts, I’d like to hear what you’ve experienced. Are you seeing an increase in downloads as well? Is the effort the same, less, or more than with an audio-only show? Let me know. 2009 marks the year of business-based online video. There is no question about this trend. Because the time a visitor spends on your website is usually measured in tens of seconds versus tens of minutes, you’ll find that online video, with its ability to capture a person’s attention quickly using both sight and sound, is becoming a top five imperative to those who expect their online presence to do more than act as an e-brochure. Not surprisingly, the power and immediacy of live television has made its way into the online video world as well. Say what you will about the “old media” of television, millions more people seek it for entertainment and education than do those online. This has lead many companies to begin putting into place Live Streaming Video as part of their marketing/branding/online revenue-generating practices. Keep an eye on this space. I will announce the registration for the free training on this blog. Hope you’ll join us.